Red – Red-colored fruits and vegetables mean they contain lycopene. This phytonutrient may help prevent cancer and maintain a healthy heart. Cooking actually concentrates the lycopene, so tomato sauce is abundant in it. Fruits that are rich in lycopene include watermelon, pink grapefruit, cherries, cranberries, pomegranate, and red grapes. As for vegetables, red peppers, beets, red onion, and red potatoes are the ones rich in lycopene. Orange – This color indicates the presence of beta-carotene, an antioxidant that is known to help protect against cancer and heart disease. It also helps enhance eye health and immunity. Foods rich in carotenes include oranges, apricots, cantaloupes, mangoes, papayas, peaches, carrots, yams, and pumpkins. Yellow – Yellow-colored foods are also rich in carotenes and limonene, which is also essential for preventing cancer and enhancing vision. Fruits and vegetables that are abundant in these nutrients include lemons, grapefruits, corn, bell peppers, bananas, and squash. Green – Green-colored foods contain the chemicals sulforaphane and isocyanine and indoles – all of which help fight against cancer by inhibiting cancer-causing agents. You can get these chemicals from vegetables such as broccoli, brussel sprouts, cabbage, Chinese cabbage, asparagus, green beans, and leafy greens; and from fruits such as kiwi, limes, and avocado. Purple or blue – Foods of purple or blue color contain antioxidants and anti-aging benefits that protect memory, urinary tract health, and lower cancer risks. Get these nutrients from foods such as blueberries, blackberries, plums, raisins, eggplant, and purple cabbage. White, tan, or brown – Allicin, which contains anti-tumor properties, can be found in the onion family. 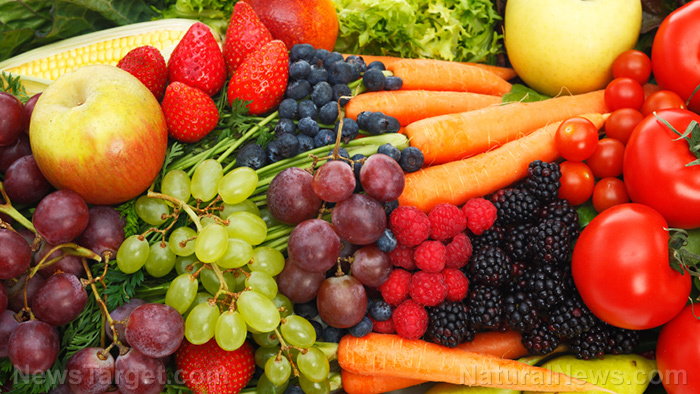 Other foods in this group have antioxidant flavonoids such as quercetin and kaempferol. They also support heart health and reduce cancer risks. Try including brown pears, dates, white peaches, cauliflower, mushrooms, turnips, potatoes, and white corn in your diet to get these nutrients. Read more news stories and studies on phytonutrients found in foods by going to Phytonutrients.news.